No, it’s not an insult. It’s fresh slices of house-cured lardo (okay, yes, it’s basically slices of pig fat infused with herbs) on top of a wood-fired pizza. Toss on a few tomatoes and you’ll never look at another piece of mushroom and pepperoni quite the same way again. And it’s just one of the devilish pizzas at Dino Bugica’s new pizzeria, Diavola. It’s a bit of destiny for the Santi chef who’s made his name as a top salumist in the North Bay. Bugica has a passion for pig — house-curing everything from prosciutto and salumi to his own sausage and lardo right on the property. If you stroll through the back gardens, you might even trip over a pig skull or two, an homage to his porcine pals. With Santi’s reputation for higher-end Italian secured, Bugica decided to branch out into a simpler “cucina povera” (the simplest of kitchen foods) next door — pizza, antipasti, sandwiches and an entire case of his fresh salumi’s for take-out. It’s just the sort of quick-bite spot that the northernmost end of the Alexander Valley/Dry Creek region was in desperate need of. Located just steps from Santi, Diavola (which means devilish in Italian) will begin serving up lunch and dinner on July 8. The opening menu includes a selection of antipasti (a seafood plate with squid, shrimp, mussels and clams; house made burrata; local tomatoes with gorgonzola and a vegetable plate) along with nine wood-fired pizzas that range from a simple zucchini flower and buffalo mozzarella ‘Margherita’ to a Ligurian clam and herb pizza or caper, anchovy and hot pepper pizza. The aptly-named Diavola pizza is topped with N’duja (a spicy Calabrian salami), arugula an Stracchino cheese. For lunch, there are also salads and pannini, along with a full wine list featuring local and Italian wines. The restaurant plans to have picnic fixin’s available soon for the grab and go crowd. Prepare for a bit of sticker shock. Prices for pizzas range from $$12.50 to a hefty $17 for the clam pizza — and we’re not talking 16-inchers here. Antipasti, like the house-cured prosciutto and seafood are priced between $12.75 and $14.75. It’s steep for an average pizzeria, but not out of line for the kind of quality and expertise that Bugica should be bringing to the table. I’ve long been a fan of his salumi, and frankly, for lardo pizza, BiteClub would be willing to pay, well, at least $14. We’ll see if the rest of Wine Country feels the same. Diavola Pizzeria and Salumeria, 21021 Geyserville Ave., Geyserville, 707.814.0111. Open for lunch and dinner, 11:30am to 9pm Wednesday through Monday. Closed Tuesday. OPENS JULY 8, 2008. Diavola Pizzeria & Salumeria. This casual sister restaurant to Santi in Geyserville features executive chef Dino Bugica’s seasonal menu of small plates, panini, pizzas and wood oven-roasted meats. 21021 Geyserville Ave., Geyserville; (707) 814-0111. Open 11:30 a.m -9 p.m. Wed.-Mon. Situated in a century old, brick-walled/hardwood-floored building, DPS sits 40 at both copper and old-bowling-lane tables, plus another 6 at the wine bar. The main event’s house-cured salumi and specialty ‘zas like the N’dugo/arugula/stracchino “Diavola”; small plates get creative with the likes of octopus w/ crostini and fennel, and ox tongue w/ potatoes, green onion, and olive oil so fresh, oxen everywhere can’t stop trying to talk about it. Geyserville chef knows how to throw a party. When Executive Chef Dino Bugica of Taverna Santi in Geyserville throws pizza parties in his own back yard, it’s easy for his guests to imagine they’ve died and gone to Italy. 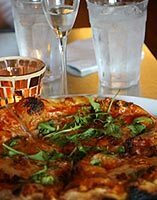 There in the heart of the Dry Creek Valley, the chef grows his own San Marzano tomatoes that he crushes into a simple tomato sauce, crowning the pizza crust with a delicious layer of acidity. Then he rounds up some fresh cheeses — dollops of Bellwether Farms’ Crescenza, creamy ricotta and rich mascarpone — to stud the sauce with gooey goodness and provide a foil for its tartness. Finally, he slices a few of his favorite toppings — spicy salami and prosciutto, aromatic arugula and cherry tomatoes, briny capers and anchovies — to make each pizza sing with deep, resonant flavor. But it’s the crust that pulls this particular pie together. From its charred center to its rippled edge, the crust exudes a smoky flavor that comes from the searingly high heat deep within his wood-fired pizza oven. 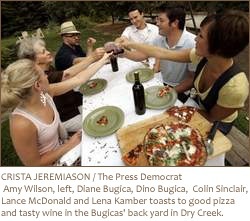 Bugica’s passion for pizza is shared by his wife, Sonja, who was born and raised outside of Pisa, Italy. Her mother taught her how to make dough as a child, and she put that knowledge to work in her uncle’s pizzeria. The couple met while Bugica was working at a seafood restaurant in Forte dei Marmi, a resort town located on the Ligurian Sea at the northern end of the Tuscan coast. Although pizza has been around the Mediterranean for upward of 2,000 years, America’s current pizza mania can be traced back to 1980, when chefs like Alice Waters of Chez Panisse in Berkeley and Wolfgang Puck of Spago in Los Angeles started reinterpreting the traditional Neapolitan pizza of Italy, creating crusty masterpieces that raised the bar on taste and texture. Like the newest crop of pizza chefs — Nancy Silverton and Mario Batali of Pizzeria Mozza in Los Angeles, Craig Stoll of Pizzeria Delfina in San Francisco and Tom Douglas of Serious Pie in Seattle — Bugica has gone public with his pizza fanaticism. This month, he opened his own pizzeria, Diavola, just a few doors down from Santi in Geyserville. Diavola offers one special entree each night, such as a baked pasta or baked Spanish mackerel. These rustic dishes, inspired by “La Cucina Povera” — the peasant cuisine of Italy — are baked in the imported Mugnaini pizza oven Bugica had installed in the restaurant’s open kitchen. When he’s not working, Bugica relaxes with his wife and family — Valentino, 4, and daughter Dahlia, 5 months — at their expansive farmhouse nestled between 14 acres of vineyards and the cool waters of Dry Creek. When the Bugicas throw a pizza party, guests are greeted out front by the aroma of lavender, mint and roses of a Mediterranean garden. Then they make their way to the backyard, where a 100-year-old oak tree towers over raised beds. To whet his guests’ appetites, Bugica likes to serve a traditional aperitif — either Campari with fresh squeezed citrus juice or a spritzer of prosecco and Aperol, an orange-flavored bitter. As an appetizer, he always offers some of his own hand-crafted salumi (he specializes in these Italian-style dried meats), along with a selection of olives. Meanwhile, Sonja has already mixed, proofed and rolled out the dough balls for the pizza party. While some chefs like to use the soft, fine flour known in Italy as “doppio zero,” Bugica prefers Giusto’s organic flour, available at Anstead’s Market in Healdsburg. It’s also important to use a decent extra virgin olive oil and water that is either purified or filtered, to help boost flavor. The couple uses an electric mixer with a dough hook to blend the dough. The entire process — mixing the dough, letting it rise, rolling it into balls and letting the balls rest — should only take about two hours. When he’s ready to cook the pizzas, Bugica sets up a picnic table next to the pizza oven and spreads out all of his toppings, along with some Parmesan cheese and olive oil to finish the pizzas. Then he puts together a half dozen different flavor combinations, such as anchovies with capers and cherry tomatoes, or spicy salami with arugula and cherry tomatoes. If you don’t have a pizza oven, you can still make a decent pizza in your own oven, with a little help from a pre-heated pizza stone or sheet tray. The couple prefers to serve a light red wine with some acidity, such as a sangiovese, with pizza. For dessert, guests are invited to scoop up a bowl of polenta pudding, sweetened with sugar-baked apple slices, raisins and honey. After dinner, the party gravitates to the shady porch, where the family keeps a foosball table and chairs for playing briscola, a popular card game in Italy. These three recipes come from Dino Bugica, executive chef of Santi and chef/owner of Diavola. Add yeast and oil to water and let dissolve. In a mixer with a dough hook, add the flour and salt. Slowly add water mixture to flour and mix for 20 minutes. As you’re mixing, slowly add more water as you need it so the dough comes together until the mixture is a little wet and sticky. If too sticky, sprinkle a little flour over it. Transfer the dough to a lightly oiled 2-quart bowl. Cover with a kitchen cloth, and set the bowl aside for approximately 30 minutes for the first rise. Then place the bowl in the refrigerator for approximately 1 hour until it has doubled in size. Once the dough has doubled its original size, punch it down to eliminate the air bubbles. On a lightly floured work surface, cut the dough into six equal pieces and form the dough into ball shapes. Using a rolling pin, roll into a 10- to 12-inch circle for the pizza crust. Bugica suggests using the San Marzano or Cento brands of canned tomatoes if you haven’t canned your own. Add all ingredients into a food processor and lightly puree. This is the favorite pizza of Bugica’s wife, Sonja. Heat ¼ cup of the olive oil on medium and add the onions, garlic, thyme and bay leaf. Cook, stirring occasionally, until most of the moisture has evaporated and the onion mixture is very soft, almost smooth, and caramelized, about 45 minutes. Discard the bay leaf and season with salt and pepper. Cover the dough with the onion mixture, add tomato sauce and mascarpone, then drizzle with remaining olive oil. Bake in pre-heated 500 degree oven for 10 minutes or until golden brown. The baking time will vary depending on whether you bake on a stone, a screen or in a pan. Be sure that your oven is well pre-heated before putting pizza in. Pull from the oven and add the prosciutto crudo and drizzle with olive oil, if desired. A casual, all-day counterpoint to sibling Santi (also in Geyserville), Diavola Pizzeria & Salumeria aims to slake the thirst and hunger of wine country travelers with humble Italian cucina povera (peasant food) served in a rustic, brick-walled setting; the midpriced menu features wood-fired, thin-crust pizzas and housemade charcuterie, washed down with Peroni on tap or a slate of L’Italia-only vinos. Stuffed squash blossoms seem to be all the rage at local restaurants right now, but they vary in quality. The ones at 25° Brix in Napa were too greasy. The ones at Scopa in Healdsburg were delectable. But the ones at Diavola Pizzeria and Salumeria in Geyserville are not only the best stuffed squash blossoms imaginable, they are perhaps the most delicious dish being served at any restaurant in the Wine Country right now. These are not the typical stuffed squash blossoms, filled with ricotta cheese, battered, then fried in oil. The Stuffed Zucchini Blossoms ($13.75 ) at Diavola are filled with a fresh-tasting mince of shrimp, tomato, parsley and zucchini, as well as bits of spicy chiles that tingle the tongue. The filling is also hot because the blossoms have been dipped in batter and plunged into the deep fryer. The oil is exactly the right temperature to puff the batter into the lightest, crinkliest, most delicate crust ever. You get three of these beauties on the plate, and they’re so good you may want to order two portions and call it a meal. But order them soon, because the season for fresh squash blossoms will be over before you know it. Executive chef Dino Bugica handles the cooking. He’s still the executive chef at Santi, the well-respected Italian ristorante owned by Bugica and Doug Swett just a few doors north, but Liza Hinman is Santi’s chef de cuisine and does the cooking there while Bugica is focusing his talents on the gourmet pizzeria and salumeria he opened in July. This team made Geyserville a destination for foodies with Santi (Italian for saints), and have now only enhanced the town’s reputation with Diavola (Italian for she-devil). As you enter the old brick building, you’ll notice a long bar to your left and, above it, a rack with house-made cured meats dangling from meathooks. Take this as a good sign. 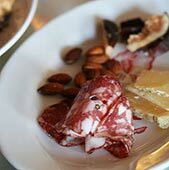 Artisanal salumi (the word means dry-cured pork products in Italian) are gaining favor in our region: Paul Bertolli’s Fra Mani in Berkeley, Duskie Estes and John Stewart’s Bovolo in Healdsburg, and now Diavola in Geyserville offer us charcuterie at a level of quality that a decade ago you could only find imported. So for sure order the Salami and Cheese Antipasto ($12.75 ). There’s a daily selection of both the meats and cheeses. On a recent night, the salumi included Toscano salami, a popular type of dry cured pork sausage that’s studded with garlic, fat, black peppercorns, and flavored with spices like cinnamon and cloves. It was sliced thinly, as was the Gentile (pronounced jen-TEE-lee) salami, named for the budello gentile, which literally translates as the “courteous intestine.” Both were excellent, aged to a sweet and intense ripeness. But the real revelation on the plate was the prosciutto, several thin slices of Parma-style ham that has been salt-cured and aged, but not smoked, and that, except for its darker color, was indistinguishable from Parma prosciutto in flavor and texture. Kudos to chef Bugica for the effort. The cheese on the plate was a pecorino soaked in bordeaux red wine to color its rind. Its smooth fattiness and focused flavor was quite delicious. Also on the plate, little slices of Italian plums. As you sit down at one of the bare wood tables, a clutch of house-made, slender, salty breadsticks makes good noshing while you peruse the menu. You may notice the pressed-tin ceiling that along with the brick walls give a 19th-century look to the place. At the far end of the bar is a blazing wood-fired oven presided over by a fierce statue of a tusked boar, and a busy chef making pizzas. A squad of cheerful and well-trained young people provides good service. The house music is an eclectic mix of just about anything. Pizzas are best accompanied by beer — there are three on tap and six more by the bottle — or by wine. It’s a surprise to see “Peterson House Dego Red” on the wine list, since “dego,” which is usually spelled “dago,” is an ethnic slur for an Italian and, if anything, Diavola celebrates things Italian. Bugica says the term is an affectionate trope for the kind of rustic red wine an Italian farmer might make. The wine list is chockablock with Italian wines. Some standouts include the 2005 Mastroberardino Falanghina for $38, a 2006 Montepulciano d’Abruzzo for $20, a 2005 Molettieri Aglianico for $43 — and, if you have a large party, gallon jugs of really good white or red wines from Hawkes winery in Jimtown for $50 each. Seven pizzas are available in one size only, about 12 inches in diameter. The Salsiccia ($14 ), or sausage, has the standard thin crust at Diavola. When it hits that hot wood-fired oven, bubbles of carbon dioxide from the fermenting yeast puff up the crust here and there along the edge. These blacken (because the dough over the bubble is really microthin) and pop, revealing the pretty beige crust inside. The sausage is house-made, and the cheese is sheep’s milk pecorino. The Don Franco ($10.50 ) is a flavor explosion of capers, anchovies, tomatoes, hot peppers and oregano. It’s Sicilian in flavor but not in style, because the Sicilians like their crust thick. The capers, thankfully, are kept to a minimum. The Margherita ($12.50 ) is made with a tomato sauce base and is topped with basil and mozzarella di bufala, the true Italian mozzarella made with water buffalo milk. These animals, first brought to Italy by the Ostrogoths 1,500 years ago, give a milk that makes a finer, sweeter cheese than cow’s milk. These pizzas are all very good, but the best may be the Quattro Formaggio ($13 ), a superb pie made with four cheeses (mozzarella, provolone, pecorino, and fontina) and topped with pitted olives and sage leaves. When it arrives hot at the table, the cheeses give off a mingled ripe aroma that makes the mouth water. Three other pizzas use ingredients like pancetta, prosciutto, house-made Calabrese salame, Italian fryer peppers, mascarpone, radicchio, escarole, and bagna cauda — a spicy hot dip. Other antipasti on the menu show the virtue of simplicity, which is a hallmark of Italian cuisine. What could be simpler than a mound of olive oil-poached Albacore ($8.75 ½) with fresh beans braised in tomato sauce? The World’s Best Tomatoes from Geyserville ($10.75 ) lived up to its name and paired the dead-ripe summer tomatoes with gorgonzola cheese. A Vegetable Antipasto ($12.75 ) was a melange of roasted eggplant, pickled zucchini, cippolini onions and roasted cauliflower, among other treasures, and while it doesn’t sound simple, all those flavors melded into a unified whole. A Chocolate-Lavender Panna Cotta ($6.75 ), served with sliced strawberries, crushed hazelnuts and a sprig of lavender in bloom made a fitting dessert. To sum up: the menu is simple — antipasti and pizzas. The recipes are rustic and straightforward. The atmosphere is clean and spare. The food is excellent, and the magic is all Italian. Veteran wine-country travelers who feel they’ve been crowded out of the emerging scene in Healdsburg know to head just north to the former stagecoach stop of Geyserville, tucked away in the Alexander Valley vineyards of northern Sonoma County. Along its lone main street, one can find affordable lodging, a few art galleries and tasting rooms, and two really fine eateries owned by the same group — Santi, a midpriced old-world Italian restaurant, and Diavola, its even-more-casual sibling that opened a few doors down in June. Executive chef Dino Bugica’s calling cards are nicely priced pizzas with just-right, half-limp crusts; hearty paninis; and salumi and sausages cured in-house. Grab a window-side table for a dazzling view of the Mayacamas peaks and relax with a value-priced wine from the mostly Italian list.